Dominick Pelli shoves all in from the cutoff. The button folds, and Daniel Podhesier re-shoves over the top. The big blind folds, and the players table their hands. The flop comes K♣10♥2♦, giving Podheiser the lead when he makes a pair of kings. The turn is the 4♥, giving Podheiser additional flush outs. Unfortunately for Pelli, the 8♣ river does not help him, and he is eliminated from play in 9th place. Event #2, the $580 No-Limit Hold'em Re-Entry event has reached the final table of ten, and the players have redrawn for their new seats at the unofficial final table. Players are currently in the middle of level 27, with 20,000/40,000 blinds, and a 5,000 ante. Jean-Philip Malrais is the chipleader of the final ten, with 4,195,000. All players are guaranteed at least $9,531, but all have their eye on the $119,141 top prize. Ralph Macri shoves all in from middle position, Panja Lymsuan re-shoves over the top in the lo-jack, and Mark Checkwicz shoves for his ten bigs in the cutoff. The flop comes K♦Q♥3♣, giving Lymsuan the lead with his set of kings. Unfortunately for Macris and Checkwicz, the 9♦ turn, and 2♠ river do not improve their hands, and they are both eliminated from play. Alex Santiago raises to 48,000 in middle position, and Mark Checkwicz calls on the button. Jean-Philip Malrais raises to 185,000 in the small blind, and Gerald Lemke Jr. shoves all in from the big blind for less (100,000). Santiago, the original raiser folds, and Checkwicz calls. The flop comes Q♠8♣4♥ . Malrais pauses for a few seconds before placing a bet of 250,000, and Checkwicz folds. The 9♦ turn and 4♠ river are of no help to Lemke, and he is eliminated in 22nd place. There are currently 38 players remaining in the six max tournament, and 18 of them will make the money. World Series of Poker regular Jason Gooch is fresh off a final table appearance in last night's Event #3 ($365 NLH Turbo). Gooch finished yesterday's event in 5th place ($3,162), and is back at it today, making another deep run in the six max event. Players are just returning from their break. Level 9 is underway and that means that registration is now closed for the $580 no-limit hold'em six-max event. The fourth event of the series saw a total of 179 entries, and surpassed the $50,000 guaranteed prizepool. The 179 entries generated a prizepool of $89,500. The top 18 players will finish in the money, all guaranteed at least $1,109, and the winner will take home $25,060, the gold Circuit ring, and 50 Casino Champion points. More information can also be found on WSOP.com by clicking THIS LINK. According to the table, Baseem Nsier just tripled up, and sent an opponent home. A player under the gun had min raised, Nsier shoved all in on the button, the big blind tank-called (having both players covered) with ace-queen, and the player under the gun called with pocket fives. Nsier flopped an eight, and held, eliminating the player under the gun, and doubling through the big blind. The flop comes J♥8♥6♠ leaving the pair of aces in the lead, but the K♥ on the turn gives Agard a set of kings to take the lead. The 4♦ on the river does not change the hand, and after a close count of chips, it's determined that Agard has both players covered, and they are both eliminated from play. The money bubble has officially burst, leaving all of the remaining 135 players in the money, and guaranteed at least $1,005. A few of the players that unfortunately did not make it into the money included: Matthew 'Bucky' Wantman, Kevin Sniffin, Andrew Weinstock, Aaron Davis, Matthew Sidari, Scott Downer, David Chaves, Alison McMahon, Caleb Clarke, Johanssy Joseph, John Ray, Chris Hancock, and Michael Knuts. Seating assignments, along with other reports, can also be found on WSOP.com. Quintin Tyson has defeated Eric York heads up to take home his first World Series of Poker Circuit ring, and $16,575. 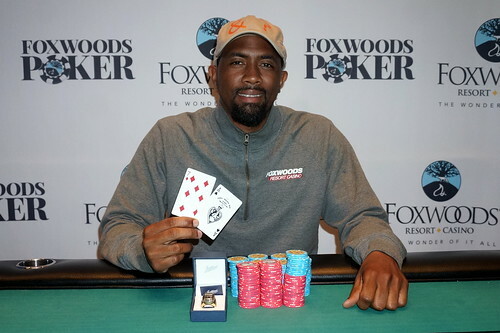 Quinton Tyson just won his first World Series of Poker Circuit ring, and $16,575, in Event #3, the $365 No-Limit Hold'em Turbo event at Foxwoods Casino. Tyson bested a field of 221 entries over the course of the one-day tournament. He started playing at 4 p.m. Saturday afternoon, and just about 12 hours later, he is now the proud owner of his own gold Circuit ring. Tyson is a busy Assistant Manager of a day program at the Kennedy Center, working with high functioning special needs adults. He works a 9-5 schedule Monday through Friday, but said that he has been trying to put more time and effort into his poker playing. Today's win is his biggest tournament cash to date, and he is ecstatic to have won a ring as well. "I have been trying so hard to get some type of poker hardware, this feels great," Tyson said. Tyson recently took a trip to Texas to help his sister move, and while down there, he took second in a smaller poker tournament. He returned from his trip just yesterday, and said that he specifically came back in time to play Event #3. "I circled this one on my calendar. Because of my work schedule, I knew that this was one I could get into, since it was a one-day event. I came back on Friday from Texas purposely so I could get here for this event." Tyson said with a smile. Eric York has been eliminated in 2nd place in event #3. He shoved all in on the button holding K♦10♥ and was called by Quintin Tyson holding A♠7♦. The board ran out Q♥8♣7♣9♣Q♣ awarding Tyson the pot, and eliminating York in second place.